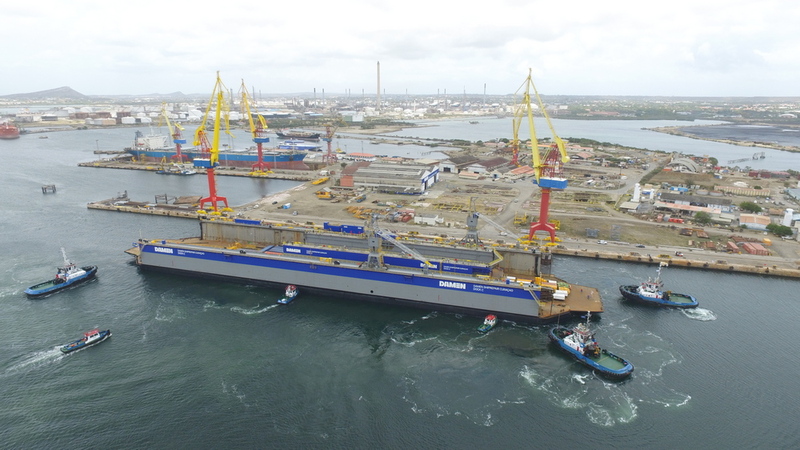 WILLEMSTAD - Following a 26-day voyage across the North Atlantic, two floating docks have arrived at Damen Shiprepair Curaçao (DSCu) in the southern Caribbean, fulfilling the undertaken given by Damen to the Government of Curaçao when it took over the yard in 2017. The two docks were delivered by the heavy-lift carrier Xin Guang Hua to the Port of Willemstad, Curaçao on 26 April 2018 following a trip with more than its share of bad weather. The larger of the two is a Panamax-class dock measuring 230 metres by 45 metres for tankers, box ships and other large vessels, while the smaller dock measures 108 metres by 23 metres and is ideal for all kinds of tugs, work boats and offshore support and anchor handling vessels. The unloading in Santa Anna Bay was also delayed due to strong winds which initially prevented the safe passage of the 98,000 DWT Xin Guang Hua under the Queen Juliana bridge, much to the disappointment of the assembled citizens of the city of Willemstad. It finally took place at 0530 the following morning, to much smaller but still enthusiastic crowds. The actual floating-off of the docks went smoothly the following day and they are now alongside the repair quay at DSCu. The yard now has a busy two to three months ahead it, both afloat and ashore. Afloat, works to the internal compartments of the docks need to be completed, with some of the ballast tanks requiring blasting, painting and repairing to make them ready for operations. Meanwhile dredging contractor Van Oord will dredge the seabed beneath the docks’ final position over the next six to eight weeks and piles will be driven in the same area to allow the construction of the dolphins required to moor and operate the docks safely. Ashore, preparations are underway to set up the necessary infrastructure to support the docks including improvements to the electrical, gas and air supply provision and investment plans have been approved for the building of a new construction hall to house the service departments, welding machines and provide training facilities to broaden the skills of the workforce. Training on the floating docks will be provided by the same dock masters who operated the docks for many years in Flushing and Pernis respectively, in the Netherlands. Their experience and extensive training will play an important role in familiarising the DSCu nautical services team with their new assets. “We plan more investment in the years ahead,” said Lodewijk Franken, Managing Director at DSCu. “This will focus on the further improvement of our facilities, equipment and tools, as well as ongoing in-house training to broaden the abilities of our personnel and make them multi-skilled. These initiatives along with our floating docks will provide a significant boost to the yard and even now our sales team is in discussions with a number of companies regarding a wide variety of vessels ranging from a local research vessel to tugs, small cruise ships and OSVs. We also plan to support regional naval vessels including those of the Royal Dutch Navy and with the support of a Damen Services team the yard will provide maintenance and repair services to Damen-built tugs and workboats operating in the region.